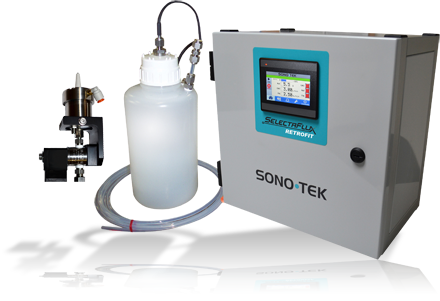 Designed to replace other fluxing systems in selective fluxing applications, Sono-Tek’s ultrasonic selective fluxing system offers the highest degree of accuracy and fine line control. Controlled velocity spray will give maximum top side fill and lower maintenance in selective fluxing applications. Compatible with ALL fluxes, SelectaFlux easily retrofits into all major selective solder machines. 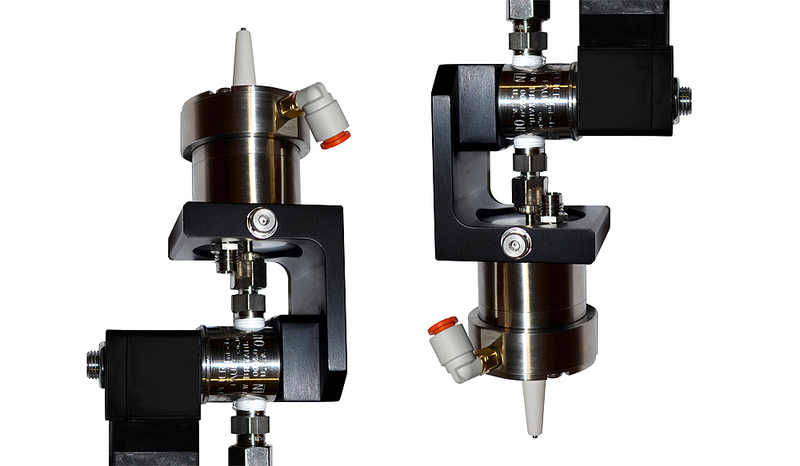 The SelectaFlux is a replacement fluxing system for selective solder fluxing machines. Designed to solve most major problems with standard fluxers like jetting and air pressure spraying, the SelectaFlux system will spray ALL fluxes with no clogging, greater accuracy, increased throughput speed, and less overspray. With over 30 years of experience in ultrasonic spray technology, Sono-Tek is a well-established leader in the spray fluxing industry, with hundreds of patented state-of-the-art spray fluxing systems installed in worldwide. The non-clogging nature of our ultrasonic nozzles gives us significant advantages over other fluxing methods in precision selective fluxing of SMT circuit boards and components as well as fluxing through-hole and SMT circuit boards with stand-alone and inline systems. We have a full line of spray fluxing systems to accommodate any PCB manufacturer’s needs, with world class service and support for all of our fluxing systems. Ultrasonic nozzle with focus-adjustable air shroud. Electronics box with touch screen control. Air and flux flow regulation. Flux tank with level sensing and filter. For selective fluxing applications, Sono-Tek’s ultrasonic selective solder fluxing system offers the highest degree of accuracy and fine line control in the selective fluxing industry. Controlled velocity spray will not harm or disturb components while giving maximum top side fill in selective fluxing applications. The selective soldering process is prohibitively slow due to long cycle times, often dictated by the very slow application of jet fluxing. SelectaFlux systems from Sono-Tek often increase fluxing throughput by 2-3 times the speed of jetting fluxers, drastically improving throughput on selective solder operations. Compatible with ALL fluxes, including rosin and water soluble flux up to 37% solids. Easily retrofits into all major selective solder machines or other systems. Reduced wasteful overspray and atmospheric contamination. Self-cleaning ultrasonic nozzle prevents clogging. Controlled -velocity will not harm or disturb components while giving maximum top-side fill. Spray pattern adjustable from 2-8 mm or 4-30 mm. Wide range of delivery rates from 1 – 250 microliters/second. Also ideal for tinning and odd-shaped components. Drastically increases throughput when compared to flux jetting systems. 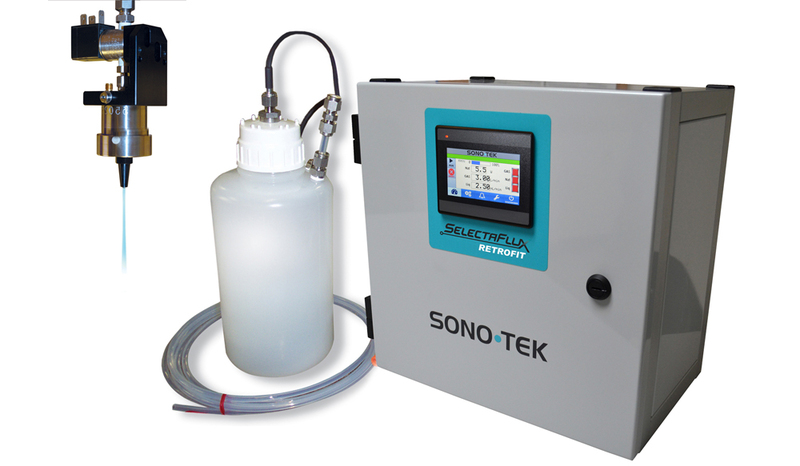 The premier Selective Solder machine manufacturers of the world offer Sono-Tek Ultrasonic Spray Fluxer Technology. Contact these Sono-Tek partners to purchase your next new selective solder machine with integrated ultrasonic fluxing capability.